Free download Outlook to Notes migration tool and Convert Outlook Emails to Lotus Notes Mailboxes. This software is an effective and reliable method for Microsoft Outlook users who wish to convert PST to NSF format. An assurance to end user is provided that the data will be protected with this product. The Outlook to Lotus Notes conversion tool provides a user-friendly interface, which satiate the demands of the customer all around the world. With help of this product, one will be able to migrate all data from Microsoft Outlook to Notes. PST file emails with their respective attachments and technical properties will be moved in NSF file format. Due to the arising need of Outlook to Notes conversion, We have generates this software. Using this PST to NSF migration tool, users can transfer entires items of their MS Outlook like mailbox, tasks, address book, email formating. Emails including every micro details like to, cc, bcc, from etc, Unicode characters to Lotus NSF files, keeps all emails formatting after conversion. It's a complete solution for PST to Lotus Notes conversion. The Outlook to Notes converter is a proficient application, which exhibits an easy file conversion from all Outlook items to NSF. These items can be emails, contacts, calendars, appointments, tasks, and notes of PST file that will be moved in NSF format via this tool. The PST to NSF conversion tool applies the modern algorithms for carrying out a rapid and safe PST to Notes migration. It attempt the file exporting task in a way that not even a single alphabet is harmed by tool at the time of processing. Each and every module of the PST to Lotus Notes NSF converter is designed in a way that it will easily be understood by customers. It permits users in exporting .pst to .nsf by simplifying all conversion difficulties and hence, making task hassle-free. The Outlook to Lotus Notes converter provides a section to select PST file mailboxes, which are to be moved in IBM Notes NSF format. Users just need to check the checkbox of targeted PST file items, which they want to see in Domino NSF file. The Outlook to Notes migration tool is enriched with unique feature of exporting emails from PST file to NSF on basis of date. This will convert messages of particular time duration and hence, eliminating time of unwanted data from being getting processed. PST to NSF conversion tool renders a useful option to apply filters on the PST file calendars and tasks items. Users just need to mentioned the ‘received on interval’ time period and rest filtering will be carried away in a seamless way. The PST to Lotus Notes conversion tool holds the folder and subfolders structure same as it was in PST file. There will be no manipulation in the structure while processing. In IBM Notes, the folders will be displayed same as they were in Microsoft Outlook. The Outlook to Lotus Notes converter provides a very useful feature to eliminate ‘Deleted item’ folder at the time of conversion. Since the folder is not as such important therefore, use this feature of product for decreasing conversion time. The PST to NSF migration tool benefits users with facility to save resultant files at a customized location. Not only this but, one can create a new folder directly from the Outlook to Notes software panel and save resultant IBM Notes files within it. Free Version: PST to NSF file converter for free permits customers to use all functionalities of the product but, enable a person to export only 15 items per folder. Full Version: Microsoft Outlook PST to Lotus Notes NSF conversion tool removes the constraint, which was faced in free version. 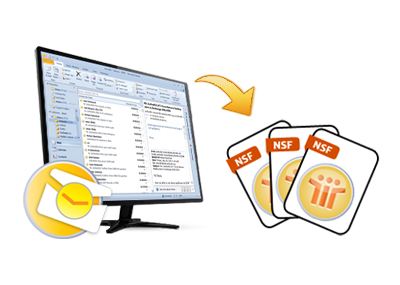 All data from PST emails folders, calendar, address book, etc., will be saved in NSF file without any complications. Step 1 : Free Download & Install Outlook to Notes Converter in your machine. Step 2 : Now, Add Microsoft Outlook PST file in the Software Panel. Step 3 : Select Outlook items(emails, contacts, etc.) & Destination Location. Step 4 : Click on Export button and Convert Outlook to Notes NSF file. Does your PST to NSF conversion tool supports batch file conversion? No, this full version of Outlook to Notes converter does not supports batch file migration. You need to opt for business or enterprise license of the product for appending support of files migration in bulk via software. What are the steps to convert PST file to Lotus Notes through this tool? Is it possible to convert password protected PST file into NSF format with help of your software? No, the OutlooK to Notes converter does not supports password-protected PST file for the conversion. Make sure that you have completely removed password from Outlook data file and then, only begin with the actual PST to Notes NSF file migration procedure. How can I open NSF file in Lotus Notes? Will your PST to NSF conversion tool work upon Windows 8.1? Yes for sure, the Outlook to Lotus Notes converter software is compatible with all editions of Windows OS i.e., 10, 8.1, 8, 7, and all below editions. Is their any feature through which I can convert selective subfolders from Outlook to Notes? No, the PST to Lotus Notes Converter renders a solution of selective mailbox migration but, not sub folders filtering.